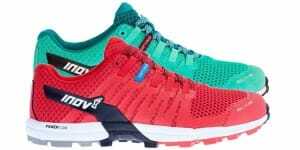 The Inov-8 Roclite 290 (together with the Roclite 305, 305GTX and 325 GTX Boot) is one the latest additions to the British brand’s trail running line up. We have been testing a pair of Roclite 290’s on a variety of terrain on the North Yorkshire Moors and Durham Dales to see if the Roclite really is the most versatile trail shoe on the market, which Inov-8 claim. The Roclite 290 has been made on a new Medium last (the foot shaped piece of wood or plastic that the shoe is constructed round, which dictates the shape and dimension of the shoe). The new Medium fit sits between the Precision (narrow) and the Standard (wide). Initially to me the shoe felt a little narrow, but the upper proved to be very soft and un-restrictive, feeling great even after 3 hours plus. Size wise I did find that I had to go up ½ a UK size in order to get a good fit. During my first outing in these shoes along a soft river bank my first impression was that they are a little stiffer than the previous Roclites and therefore potentially not as nimble, but I often find new Inov-8 shoes stiff. The fact is, after a few longer runs the shoes have become much more flexible and a bit softer underfoot too, which is great. Most of our customers are looking for one off-road shoe that will be able to cope with every type of terrain, but this usually isn’t possible. A flexible, heavily studded fell shoe isn’t really designed to offer much protection on the hard rocky tracks. The Roclite’s however are Inov-8’s compromise, with 6mm aggressive studs for good grip in the mud (but not as much as the 10mm studded Mudclaw). The Powerflow mid sole offers good cushioning for harder trails but not as much as, say, the Trail Talon 275 which is designed for harder trails. 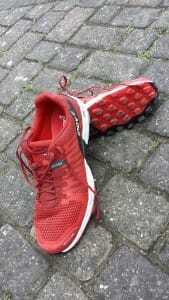 Like the previous Roclite, where this shoe comes into it’s own is when your run includes a variety of terrain. This is very common in the UK where runners often start with a few miles on the road, then venture over fields, moors and through the woods. The Roclite 290 is ideal for that sort of running. I still think it’s less nimble than the previous version, but Inov-8 have listened to the trouble previous customers like ours were having where they could feel rocks and stones through the shoe after running for a few hours. This was not noticeable in the Roclite 290 as the new Powerflow mid sole coupled with the larger lugs gives you more protection. The outsole is made from three grades of sticky rubber to give it great grip on wet rock whilst maintaining some durability when used on harder terrain. I have crossed rivers standing on wet slabs and not noticed any slippage and run up greasy steps and maintained good traction. Of course when descending quickly I had the odd slide, but I think this is merely due to the size of the lugs rather than the compound. On the whole the grip is fantastic. I have thoroughly enjoyed running in the Inov-8 Roclite 290’s, will continue to do so and recommend a pair if your regular runs look like mine; a short road run, onto some trickier tracks, often through mud and the reverse on the way home! For the full technical specification click through to our Roclite 290 page here.